As you can see, the Agile legend is much simpler than the Traditional legend. On planet Agile, there aren’t any formal requirements artifacts that specify system capabilities, application functions, subsystems, inter-subsystem interfaces/interactions, components, or inter-component interfaces/interactions. There are only lightweight, independent, orthogonal, bite-sized “user stories“. Conformant Agile citizens either pooh-pooh away any inter-feature couplings or they simply ignore them, assuming they will resolve themselves during construction via the magical process of “emergence“. Unlike in the traditional world, in the Agile world there is no distinction between application-specific Infrastructure Code and Feature Code. Hell, it’s all feature code on planet Agile. Infrastructure Code is assumed as a given. However, since developers (and not external product users) write and use infrastructure code, utilizing “User Stories” to specify infrastructure code doesn’t cut it. Perhaps the Agilencia should rethink how they recommend capturing requirements and define two types of “stories“: “End User Stories” and “Infrastructure User Stories“. Regarding the process of “Design“, on planet Agile, thanks to TDD, the code is the design and the design is the code. There is no need to conceptually partition the code (which is THE one and only important artifact on planet Agile) beforehand into easily digestible, visually inspect-able, critique-able, levels of abstraction. To do so would be to steal precious coding time and introduce “waste” into the process. With the exception of the short, bookend events in a sprint (the planning & review/retrospective events), all non-coding activities are “valueless” in the mind of citizen Agile. When asked about “What happens before sprint 0?”, one agile expert told me on Twitter that “agile only covers software development activities“. As the process timeline template below shows, there is no Sprint -1, otherwise known as “the Front End phase“, on planet Agile. Since the Agile leadership doesn’t recognize infrastructure code, or the separation of design from code, and no feature code is produced during its execution, there is no need for any investment in any Front End work. 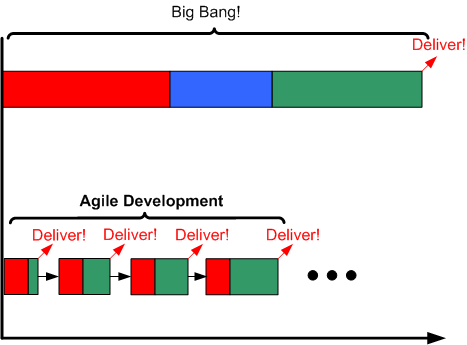 But hey, as you can plainly see, deliveries start popping out of an Agile process way before a Traditional process. 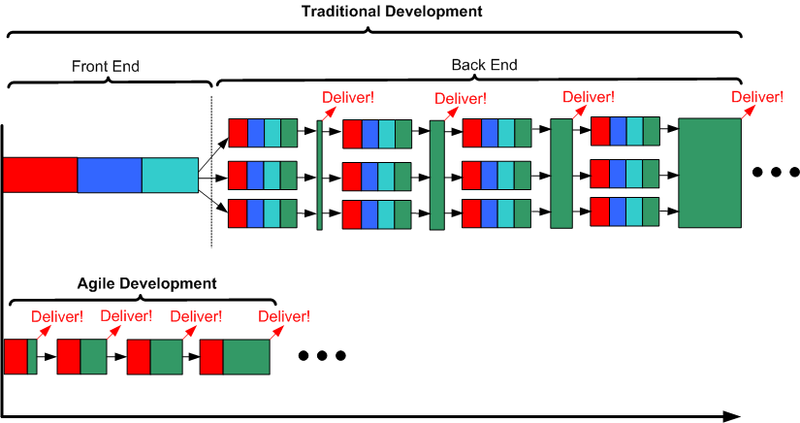 In the specific example below, the nimble Agile team has popped out 4 deliveries of working software before the sluggish Traditional team has even hatched its first iteration. It’s just like planet Agile’s supreme leader asserts in his latest book – a 4X productivity improvement (twice the work in half the time). The flexible, dare I say “agile“, aspect of the Traditional development template is that it scales down. If the software system to be developed is small enough, or it’s an existing system that simply needs new features added to it, the “Front End” phase can indeed be entirely skipped. 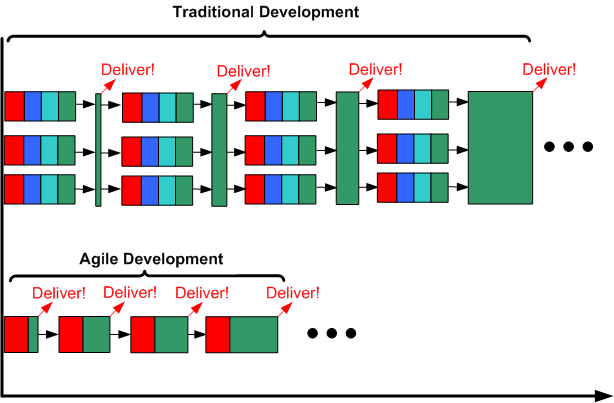 If so, then voila, the traditional development template reduces to a parallel series of incremental, evolutionary, sprints – just like the planet Agile template – except for the fact that infrastructure code development and integration testing are shown as first class citizens in the Traditional template. On the other hand, the planet Agile template does not scale up. Since there is no such concept as a “Front End” phase on planet Agile, as a bona fide Agilista, you wouldn’t dare to plan and execute that phase even if you intuited that it would reduce long term development and maintenance costs for: you, your current and future fellow developers, and your company. To hell with the future. Damn it, your place on planet Agile is to get working software out the door as soon as possible. To do otherwise would be to put a target on your back and invite the wrath of the planet Agile politburo. In the mind of citizen Agile, simply mentioning the word “Traditional” conjures up scary images of Niagara Falls, endless BRUF (Big Requirements Up Front), BDUF (Big Design Up Front), Big Bang Integration (BBI), and late, or non-existent, deliveries of working software. Of course, as the citizenry on planet Agile (and planet Traditional) knows, many Traditional endeavors have indeed resulted in failed outcomes. But for an Agile citizen to acknowledge Agile failures, let alone attribute some of those failures to the lack of performing any Front End due diligence, is to violate the Agile constitution and again place herself under the watchful eye of the Agile certification bureaucracy. You may be wondering, since I’ve taken on the role of an unapologetic Traditionalista in this post, if I am an “Agile-hater” intent on eradicating planet Agile from the universe. No, I’m not. I try my best to not be an Absolutist about anything. Both planet Agile and planet Traditional deserve their places in the universe. In your succinct Agile rebuttal, or turn around is fair play rant, you neglected to note that “girls just wanna have fun”. Coder’s just wanna code, and hater’s gonna hate. In my many moon walk with SW development, I have noticed that the fundamental problem is this: great software folk are “creative types” and are the most productive when they’re writing code. To them it’s like their art work. For anyone to criticize it, is like telling them their baby is ugly. How do you make an Agilista crap his pants? Tell him you instituting Fagan inspections on all code before it can be added to the production build! Agile is just the latest in a long line of attempts to free their inner cowboy coding practices. Agile, has an important twist, little incremental “performances” where management can see the shiny new feature working, albeit with little or no attention paid to the structure or quality of the code. Phphpht, what comes around goes around.